The Orange Order and the unionist political leadership must bear the primary responsibility for the instigation and orchestration of widespread and intense violence in the Six Counties over recent days. By their clearly inflammatory words and actions before the Whiterock march and by their mealy-mouthed justifications of street violence subsequently, they have exposed their hypocrisy and political bankruptcy. As well as the unionist gun and bomb attacks which were widely covered in the media, the past week also witnessed widespread and vicious attacks across the Six Counties against nationalist men, women and children, their homes and businesses and attacks on Catholic churches. As readers of An Phoblacht are well aware this was the culmination of months of such attacks against nationalists. But it has taken the events of recent days with unionists shooting and bombing the PSNI for commentators in the media, particularly in the 26 Counties, to bother focussing on unionist violence. 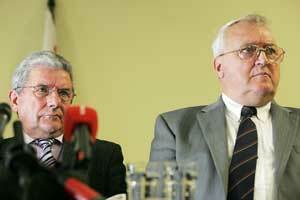 Worse still however is the ignorance or indifference of 26-County Justice Minister Michael McDowell. After three days of orchestrated unionist violence, much of it directed at nationalists, he attempted to place the responsibility for this on republicans. Nationalists in the North will find McDowell's analysis of unionist violence very far removed from the reality of their daily lives. It was another disturbing example of the cynical posturing of establishment politicians in the 26 Counties and the PDs' bizarre interpretation of events North of the border. The ambivalence and double standards of unionist and Orange leaders over the past week has been breathtaking. Like bold children they have attempted to blame everyone but themselves. It is long past time that they grew up. Nationalists who bear the brunt of unionist violence are sick and tired of the bad leadership and bad example being set by unionist politicians. The Good Friday Agreement puts a clear responsibility on the Dublin and British Governments to protect the rights of people to live free from the fear of sectarian attack and intimidation. They have abjectly failed to uphold this right in relation to the nationalist community.